Craig Thompson's Carnet de Voyage, a travel diary of his time spent in Europe and Morocco in 2004, is filled with sketches of the people and places he encountered along the way. Traveling on a book tour for Blankets (Drawn and Quarterly, 2015), he'd been tasked with a great deal of promotional appearances, and as the reader learns at the end of the travelogue, this diary was to be published soon after his return from his tour. In addition to the original published version, this new hardcover expanded edition includes a 32-page Afterword/Epilogue from 12 years later, documenting the process of creating a book while traveling. Thompson makes it clear that this diary is composed of quick snapshots and sketches, without the use of photographs, and the looseness of the drawings comes through beautifully. Thompson is a gifted cartoonist, with an ability to tell long, complex stories while never sacrificing intricate details or the fluidity of his drawings. Here, his sketches still manage to convey those same skills, while retaining an on-the-fly quality that works especially well for the genre. As should've been obvious to fans of his autobiographical masterpiece, Blankets (though there is a funny moment in Carnet de Voyage in which he finds a copy of Comics Journal at the apartment of Laureano, a representative of his Spanish publisher, that gives Blankets an honorable mention, causing Thompson to immediately declare: "Comics Journal hates me. "), there is little that's off-limits. The naked honesty that marked Blankets as so affecting, remains a part of this diary, and allows the reader a true glimpse into Thompson's emotional life. Thompson's travels begin in France and the time is filled with friends, new and old, many promotional appearances and signings, and the pain of a torn ligament in his foot. Then embarking on the Moroccan portion of his trip, Thompson is hampered by the pain of his injury and quickly assaulted by the differences between the two countries he's visited so far. He repeatedly laments the separation of sexes, as Thompson's penchant for drawing women is nearly impossible in Morocco, struggles with digestive issues and tendinitis, and wallows in loneliness at his inability to communicate. Still, he does make some connections with local people that make an impression and, as he prepares to leave Essaouria for Fez he finds himself sad to do so. ("So easy to love a place on the day you're leaving.") 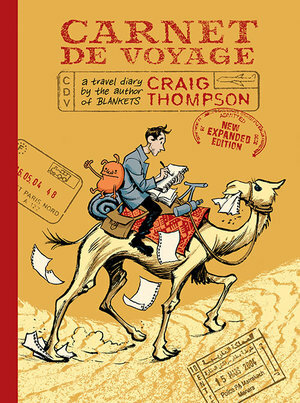 It's Thompson's candor in conveying what he feels in the moment, while still acknowledging his sometimes ill-tempered interactions and prejudices, that make Carnet de Voyage so engaging. Following Morocco, Thompson's travels take him to the Alps and a reunion with his French friends Laëtitia and Frédéric. Immediately more comfortable among Europeans, and reveling in the natural beauty around him (Thompson is a self-confessed "nature boy"), the contrast to his time in Morocco, mainly in crowded cities, is apparent. Similarly, he is able to engage with fellow cartoonists, such as favorites of his, Blutch and Lewis Trondheim, though he still struggles with health issues and sickness no matter where he is. There are moments that stand out in their seeming out-of-placeness, such as an outing for laser tag and an acupuncture session, but their addition gives the diary more authenticity than if it were merely a cliché-riddled account of the glories of traveling abroad. Travel is inherently marked by moments of beauty, mundanity, exhaustion, and connection; Thompson shows it all. Drawings of Antoni Gaudi's otherworldly structures and a brief romance with a Swedish woman, Hillevi, living in Barcelona dominate his time in Spain. Hanging over the entire diary though, is his ex-girlfriend Melissa. The occasional emails between the two and his repeated thoughts of their relationship, make her sporadic appearance just as memorable as his travel. The final and additional pages to this expanded edition include a return to some of the same people and places from the original diary, as well as candid observations on the difficulties of creating a publishable travelogue while on the road. Thompson explains how he was challenged and encouraged to draw every day, especially knowing it would be sent off for publication while still traveling. The decisions made, from non-native-speaking early proofreaders to leaving out the final days of the trip due to them solely being promotional events, are explained. Thompson's critical eye turned to his initial impressions are also valuable and speak to the immediacy of the diary, particularly when he characterizes his time in Morocco as an initial research trip for Habibi (Pantheon, 2011). Carnet de Voyage captures many of the highs and lows that accompany traveling for an extended period, and Thompson's willingness to be present and honest make it a perfect bridge between his two larger narrative accomplishments, Blankets and Habibi.